MFT Card Challenges: An MFT 10th Birthday Celebration Bonus Challenge! An MFT 10th Birthday Celebration Bonus Challenge! This month My Favorite Things is celebrating our 10th birthday, and we couldn't pass up having YOU join us since you're the heart of making us what we are today! In honor of our birthday, we're issuing a bonus challenge to you. Create cards, scrapbook layouts, home decor, treat containers, mixed media, etc., that include the number 10 in some way. A project that uses 10 colors of card stock. A project that uses 10 colors of ink. A project that uses 10 different stamps. A project that uses 10 different Die-namics. A project that uses one stamp or Die-namics 10 times. A project that has 10 embellishments. Use your imagination and do something that has something to do with 10! Be sure to link your project below for a chance at a My Favorite Things Gift Voucher worth up to $20. Be sure to mention in your post how the number 10 comes into play in your design. In this card, Yoonsun has incorporated ten stamps from the You're Rawr-some stamp set - three dinosaurs, three tufts of grass, two palm trees, and two sentiments. 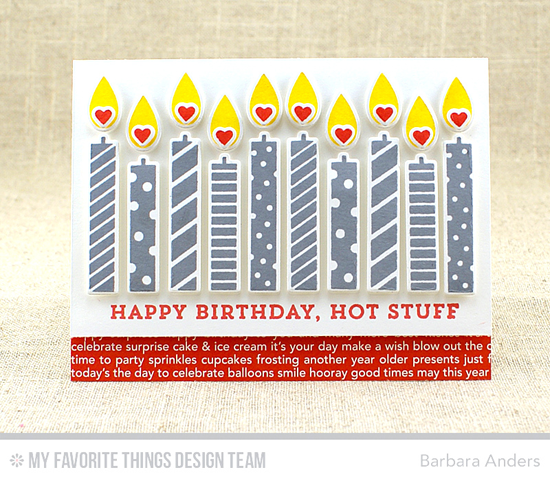 Barbara gets right to the point with 10 festive candles using the Make a Wish Card Kit. This card kit is sold out, but the stamps and Die-namics will be available in a future release! You have until Wednesday, July 20th, at noon EDT to add your link and be eligible for the prize of up to $20 in MFT Cash to be spent in the MFT boutique. One winner will be chosen at random, so everyone has a chance! The prize is a $15 Gift Voucher to My Favorite Things, but if you use MFT stamps and/or dies in your project, you’ll receive an extra $5. We can't wait to see what you create to celebrate our 10th birthday! This challenge was so much fun!! Happy 10th Birthday MFT!! As many as your little heart desires, Jess!